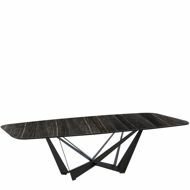 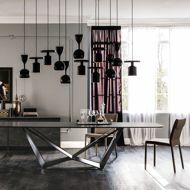 The SKORPIO collection, by CATTELAN ITALIA, is a family of contemporary Italian dining tables that create a balance between modern and industrial design with their edgy angular base. Our SKORPIO is done with a barrel shaped top, this rounded top plays with the angular base. 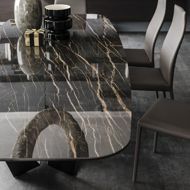 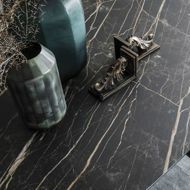 However, the SKORPIO table comes in several different shapes and sizes, with the ability to choose from a variety of tops in glass, ceramic, wood or even a combination of ceramic and wood.